Would You Help This Aggressive Mountain Lion Cross A Freeway? The mountain lions of Santa Monica are fenced in between an ocean and a freeway. It’s been that way since the 1970s when the Ventura Freeway was developed in the area. With their habitat fragmented, their gene pool has been decimated by inbreeding, putting their survival at risk. Male mountain lions are territorial. The fragmented habitat only provides enough territory for two breeding age males at any given time. There is not enough unique DNA flowing through the gene pool for their population to survive. In 2015, the two males in the area were dubbed P-27 and P-12. The “P” stands for “Puma concolor” and the number is simply the order in which researchers became aware of them. Later in the year, researchers discovered a new mountain lion in the area, an outsider who must have crossed the freeway. The mountain lion, dubbed P-45, represents new DNA into the struggling gene pool, but also a potential threat to nearby human residents. P-45 introduced himself to the area’s residents in late 2015 by killing an alpaca at a nearby winery. Afterward, researchers tracked him down and placed a GPS collar on him. Conservationists were thrilled to learn that a new breeding-age male had come to inject the DNA pool with some much-needed diversity, but residents were less-than-thrilled when more domestic animals were killed. Since his discovery a little over a year ago, P-45’s GPS collar has shown him to be in the area, and most likely responsible for the deaths of over 60 domesticated animals. These include sheep, alpacas, a miniature horse, llamas and a 450-pound female cow that residents kept on their property. Not only were these kills fatal to the animals themselves, but they also took a financial toll on local business which relied upon them. What concerned residents more than the amount of animals killed was that P-45 was barely eating any of them. Other than the goats, alarmed residents believe this mountain lion “outsider,” from the other side of the freeway, was hunting for fun. Could it be long before humans become his next prey? If you run into a mountain lion, experts believe you should maintain eye contact, look big, make a lot of noise (preferably not whimpering) and fight back if they attack. The chance of you being attacked, however, is pretty small. There have only been three fatal mountain lion attacks in North America since the turn of the century. But, considering P-45s behavior, Santa Monica residents don’t want to take any chances. It is illegal to kill mountain lions in California, unless given a depredation permit. Such permits are given out if an animal poses a threat to a person’s health or property. Late last year, a permit to kill P-45 was given to Victoria Vaughn-Perling, stemming from a gruesome attack on her ranch that left 11 alpacas dead. Community meetings were held where conservationists clashed with those worried about P-45’s aggressiveness. They debated on whether or not his behavior went beyond that of a normal mountain lion. The importance of DNA diversity in the population was debated alongside concern that it could lead to a more aggressive next generation of lions, with P-45 as the patriarch. All of this because a population of mountain lions became trapped between a freeway and an ocean in the 1970s. In the end, Vaughn-Perling chose to let the depredation permit expire, stating she did not want the mountain lion to die. Instead, volunteers from the Mountain Lion Federation and the National Wildlife Federation (NWF) stepped in to help the rancher. Large protective pens were built on her property for the alpacas, ones that will keep P-45 out. The cost of the pens was paid for by the NWF. 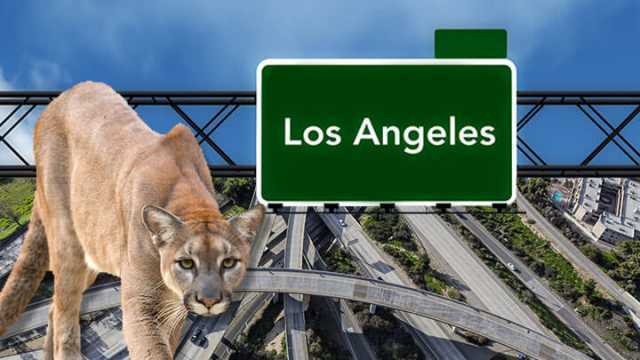 Nobody’s too sure how a male mountain lion named P-22 got into Griffith Park, but he would have had to cross two dangerous highways to do so. Since 2002, researchers have recorded 12 mountain lions struck and killed by motorists as they attempted to cross roads and find space. P-22 survived a trek that many of his species do not, or are not, willing to attempt. Researchers believe P-22 was born in the Santa Monica Mountains to his parents P-1 and P-2. By the time he was grown, he needed his own territory, otherwise he would face the wrath of the other breeding age males in the region, such as P-45 or even his own father. The only problem was that there was no habitat left where he was born. To survive, he needed to find new lands. Despite the odds against him, P-22 navigated freeways and urban areas to end up in the park where the Hollywood sign sits. P-22 has become something of a symbol for wildlife triumphing over human development. Facebook pages and Twitter accounts set up in his name humanize the animal as he attempts to live in a world half ours and half his. He is the lion who lives near the Hollywood sign. Fittingly, there are even plans to make a documentary on his life. P-22 is surrounded by urban areas, with territory much smaller than what normal breeding age males would carve out for themselves. He’s there because there was nowhere else to go. When animals run out of habitat, they start venturing into places we consider ours. But from a different perspective, it seems when humans run out of habitat we start venturing into theirs. The genesis of this issue has always been the habitat fragmentation which occurred with the construction of the Ventura Freeway in the area. Any answer on how to help the mountain lions of Santa Monica must involve re-attaching their habitat with other places they can go. Thankfully, there are such plans in development. The Liberty Canyon Wildlife Crossing is a proposed plan to build a crossing overtop of the freeway which would be safe for wildlife to use. The pass would be vegetated, including the planting of mule fat and coastal sage, which has an alluring scent for wildlife. The mountain lions and other species would then be able to cross over the freeway and into the Santa Susana Mountains and the Los Angeles Padres National Forest. The National Wildlife Federation is hoping the project will begin in 2020, but funding is a concern. The passing will cost an estimated $50 million. Concerned individuals are able to donate directly to the project’s funding through this link provided by the NWF. Please share this article with your friends, family and anyone else who wants to help support the mountain lions of the Santa Monica Mountains. Next articleCan Intermittent Fasting Take Your Weight Loss To The Next Level? Hey Buddy!, I found this information for you: "Would You Help This Aggressive Mountain Lion Cross A Freeway?". Here is the website link: https://www.thealternativedaily.com/how-to-help-mountain-lions-cross-the-freeway/. Thank you.